After working at the lodge for a couple hours, I toured up the ridge to the top of Pt 8100′. 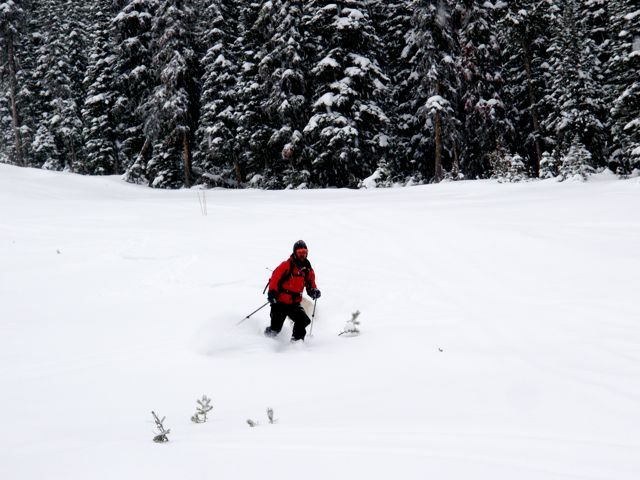 There was about a foot of heavy settled snow at the lodge, two feet at 6500′-7000′ and nearing three feet at 8000′. With the warmup it was settling fast and the slide factor was rather high with the buried thick layer of facets. My pit at 7800′ showed well faceted snow at the ground to a crust layer at about 10 cm with more facets above this sandwiched between another crust layer, and the final snowstorms slab sitting about a foot and a half on top of this scary situation. An isolated column failed at CT18 on the sandwiched facets. After failing it sat there. The snow settled in isolated whumpfs, but without cracking or producing any avalanches. I continued up to the top and snapped this photo of the backbowls starting to come into shape. Skiing back down the hill was good at the top, followed by heavy snow and rocky and woody terrain. I face planted a couple times as my skis ground to a stop on rocks and my skis augered into the baseless snow in the lower elevations below 7000′. It was good to get out, but we need another storm or two to make the skiing good up here. With more snow in the forecast the outlook is good for skiing on Downing Mountain and in the Bitterroots at large. 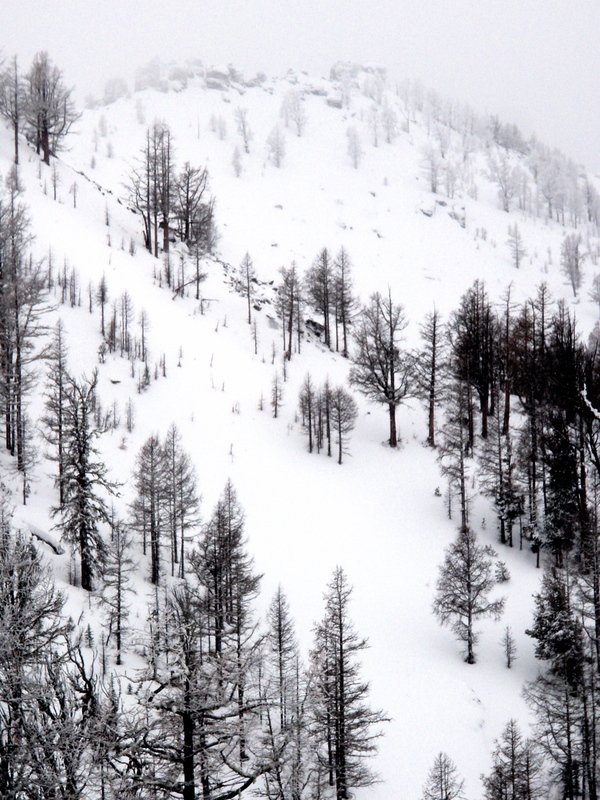 Skiing at Lost Trail has improved immensely with the week’s worth of storms that came in dense and settled nicely sticking to rocks and trees and leaving a light layer of powder on top. We headed out this morning into the snowstorm and skied a few sublime powder runs at the unopened slopes of lost trail. With knee deep bottomless snow at times the skiing was really fun and the powder was better yet, a light north wind had ushered in at least four inches of fresh snow. As my first day out it was a great time for enjoying winter’s blast during a dry powder storm! Nothing better than enjoying the first powder day with dry Rocky Mountain powder. No instabilities noted on wild snowfields, though baselessness will cause some concerns on anything but smooth ground bases. Stick to bear grass slopes on east through north aspects if possible, avoid rockfields! Brian skis powder for the first time in ten years, too busy kayaking!